Yes, I know these look more like UFOs or maybe octopuses, but they are supposed to be gingerbread angel wings. I made them to take to my Yule tree angel and fairy doll workshop yesterday, using a recipe from my book Pagan Portals - Poppets and Magical Dolls. It is thought that things like gingerbread biscuits were the very first type of decoration put on Yule trees and that Christmas tree decorating in general started in Germany and Scandinavia around the 15th century. If you want to make gingerbread angels or fairies to hang from you tree, then get a suitable cookie cutter for the basic shape (better than the one I used here! 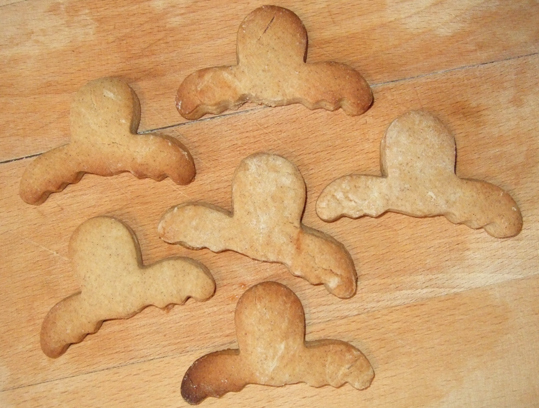 ), but put a little hole in the top before you bake the biccies. You can then put ribbon through them after they are cooked, to hang them from your tree. Today is also the traditional time to make a Christmas pudding. The fruit pudding - or plum pudding - has its origins in medieval England. It usually contains alcohol, so making it a month before the winter feast is supposed to give it enough time to mature. Do you make a pudding for the winter festivities and, if so, when do you make it? If you are a pagan, do you eat it on the Winter Solstice at December 21st or do you eat it on Christmas Day, the 25th? Those are darling. They look like the angels that top colonial gravestones. I've seen them with human faces and skull faces. With some frosting details on their wings and face they would be amazing. There is a funny part to this, I live in Alaska and have a similar cookie cutter. If you turn those gingerbreads you made upside down they look just like a moose.That's brilliant! Now I'm going to use my moose cookie cutter to make gravestone angel cookies. :) Wondering what your cookie cutter was being sold as. Angel? Moose? Or something else? You know, I now think it probably was meant as a moose cookie cutter!